Tookata is the Khao Tham Center Manager. She is the one who ensures that we have food, water, toilets, and other important things, and that our retreat days go smoothly. She also takes dhamma questions, conducts retreatant interviews, and guides us all day long by her everyday actions as well as her formal ones. She may lead morning/evening chanting and meditation instructions, depending on the schedule. Tookata has been working at and supporting Khao Tham for over 30 years, and was assistant to Khao Tham Center founder Mae Chee Ahmon during her lifetime. 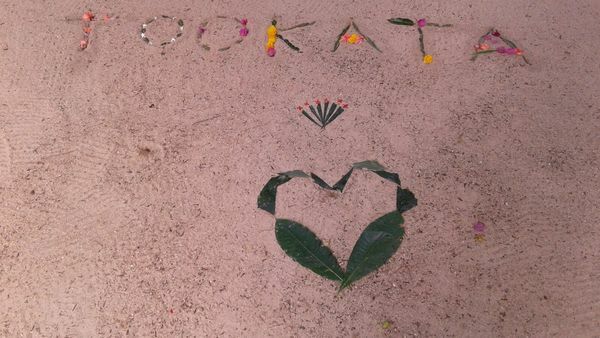 Flower-and-leaf art made by February 2018 retreatants on the sands of the upper meditation grounds.